Good Life Ceramics is a welcoming make-your-own ceramic art studio. 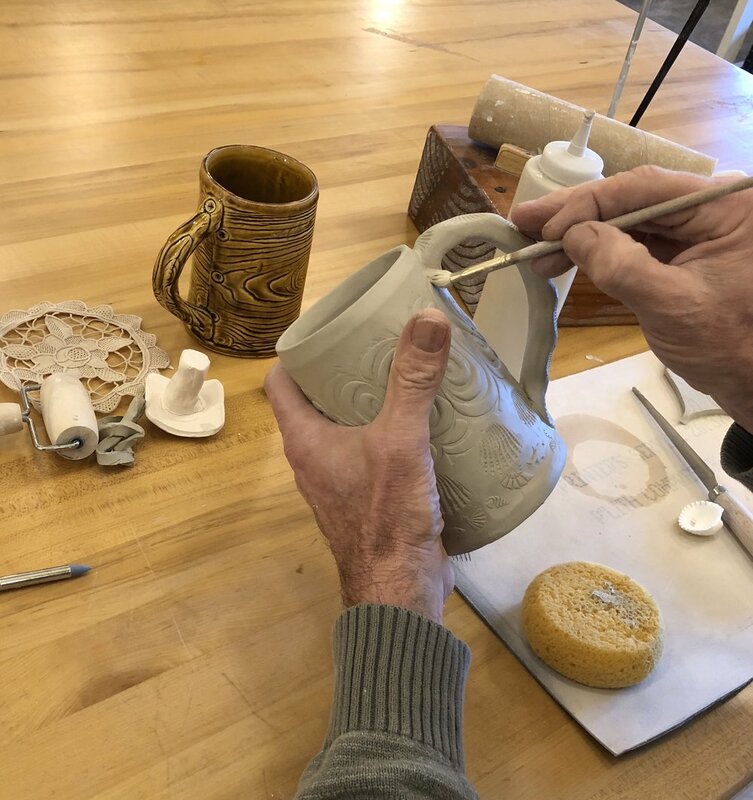 With guided projects for walk-ins, pottery classes and clay camps, a fully equipped studio for members and the option to reserve the studio for private parties and corporate offsites, individuals are able to experience the beauty of clay. Working with clay is simple and rewarding. We prepare clay slabs on which you imprint texture. A quick demo on texturing and a practice slab allows each guest to experiment before beginning their chosen project. Project slabs are cut to the correct size with the aid of wooden templates. When you are finished texturing, you then construct your project. Our staff explains the whole process and will guide you along the way, providing help and encouragement. It’s fun. When you are finished hand-building your project, you select a glaze choice from our test tile display. We do all the rest. Projects are dried, bisque fired, glazed and then fired again. Most projects are ready for picked up within 2 to 3 weeks. Shipping also available. No Reservations needed for individuals and small groups! Most guests spend two hours enjoying this process. Memberships include full use of studio space including electric wheels, slab roller, extruder, work tables, glaze room, membership tools, personal locker and works in process storage space. We offer two membership options. Members may purchase for $159 a monthly membership with unlimited hours or a monthly membership with 10 hours of studio time for $100. Hours expire if not used within one month. Options available to upgrade to a monthly unlimited membership for $59 or the purchase additional hours at $10 per hour if desired prior to end of term. Both plans require members to purchase their clay from Good Life Ceramics. Clay purchases cover house glazes, bisque and glaze firings. To purchase, visit the studio or click the SHOP tab at top of this page. Summer Clay Camps and year around Wheel Throwing Classes! 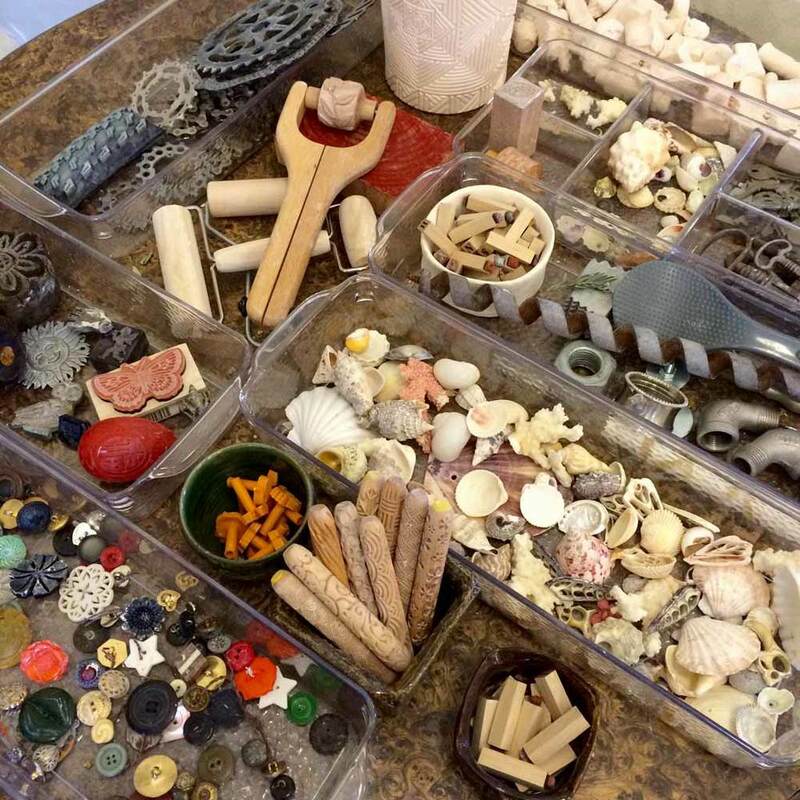 Lots of great learning options to discover the joys of clay. Grab a friend or just join in and discover the beauty of clay! It's your very own art camp! Weekly Clay Camps priced at $385. Six week Wheel Throwing Classes priced at $325. Click the SHOP tab on the top of this page for the details, availability and to reserve your spot! Make it a fun date with your sweetheart or grab a few friends. Swing on in and share a table. It's a fun thing to do in Santa Cruz! Available seven days a week during open business hours. Please call ahead if your group is more than six guests or if you wish to reserve a table. Also, please let us know if you have any special requests. Participants choose projects priced from $10 to $46. Lots of great options! Bring your own refreshments if desired. Call 831.515.7560 today if you wish to reserve a table. We offer the option to reserve the entire studio accommodating up to 36 guests. Team members choose from a selection of walk-in projects. Project choices range from trays to mugs and vases. Our most popular project is our large mug. We prepare your project slabs in advance and provide all the tools and textures necessary to complete your projects. We coach and encourage you along the way, offering help as needed. When you finish your projects, you then select your glaze option from our displayed test tiles. We do all the rest. Projects are dried, bisque fired, glazed and then fired again. Projects will be completed and available for pick up or delivery in two to three weeks. Corporate off sites for teams from the greater Silicon Valley including San Francisco, Menlo Park, Sunnyvale, Cupertino, San Jose, and Los Gatos. Visit Good Life Ceramics in beautiful Pleasure Point and we will deliver your finished off site projects to your team location free of charge. We believe that all people are naturally creative. We also believe that working with clay allows people to easily realize this creativity. Your off site event creates the opportunity for each team members to engage in this process and fuel their creative confidence with guided hand built clay projects. The experience is fun, very social and engaging! Power the spirit you value, enjoy time together and find a place of creative confidence within the process of hand building your one of a kind project at Good Life Ceramics. Our pricing is simple. We offer 2 to 3 hour events. Event selections start at $55 per person with a minimum event cost of $550. Customize your event to meet your wishes. Catering services available or you may self arranged if desired. Please email or call to schedule your offsite. Make a special event for your circle of friends and family. We offer the option to reserve the entire studio accommodating up to 36 guests. Your guests have the opportunity to make projects from prearranged offerings. Enjoy time together and fuel your creative confidence at Good Life Ceramics. Our pricing is simple. We offer 2 to 3 hour private events. Event selections start at $55 per person with a minimum event cost of $550. Higher priced events available if desired. Catering services available or may be self arranged if desired. Please email or call to schedule your party. Can't get your group to Santa Cruz? We will come to your location with all the needed tools and materials. Call or email and we can arrange your very own onsite. Create and connect for two to three hours while enjoying the beauty of clay. Prices start at $65 per person with a $650 minimum. Travel charge may apply depending on distance. 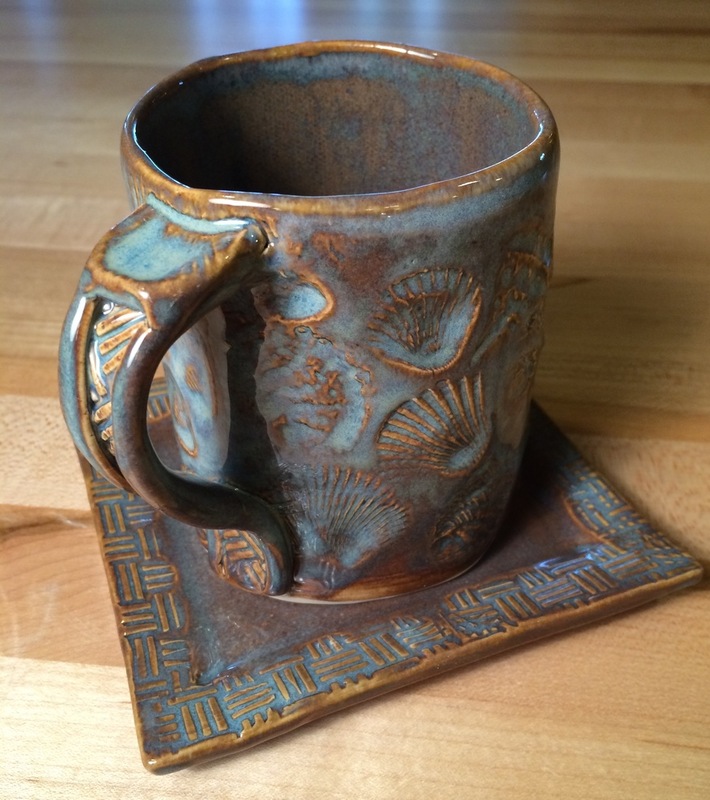 Our large mug is our most popular project and we offer other great options as well!